Two men took very different paths to get to where we are now. For Joe Louis, the path has been one of the legendary feared steamroller, as he tore through the group stages with two wins over Max Baer and Primo Carnera leading to a hilarious no-contest bit of comedy against arch-nemesis Max Schmeling before turning his attention to shredding the best the 1940s could throw at him in the person of Billy Conn and Jersey Joe Walcott. Finally, the Brown Bomber demolished Jack Sharkey in a single round—indeed, only Walcott had been durable or fortunate enough to take Joe Louis to a point where he heard the bell at the end of the first. Ezzard Charles got here by being the ultimate thinking man’s fighter. Anyone with a good punch can score a knockout on any given night—and indeed, Charles had done so a time or two—but it was his pair of wins over Rocky Marciano, both by decision, that made Ezzard Charles’ name in this tournament. The Cincinnati Cobra was more like a mongoose in there as he outboxed the men in front of him. Jersey Joe Walcott had tried to outbox Joe Louis and learned the hard way that the man pulled out of time from June 22, 1938 was quite a different man from the older fellow that had given the man from Camden, New Jersey his greatest triumph. Ezzard Charles was pulled from a big win over Louis too, on September 27, 1950, but this was not 1950 Joe Louis in front of him. How would this fight go? Would it be an anti-climactic smashing of a hopeful but doomed opponent? Or could Ezzard Charles pull off the impossible? February 18, 1989. Caesar’s Palace, Las Vegas, Nevada…the Fight of All Centuries had begun. Joe Louis came out as he had in every other fight, looking to smash his opponent and make short work of the proceedings. His jab was sharp, his power punch sharper. 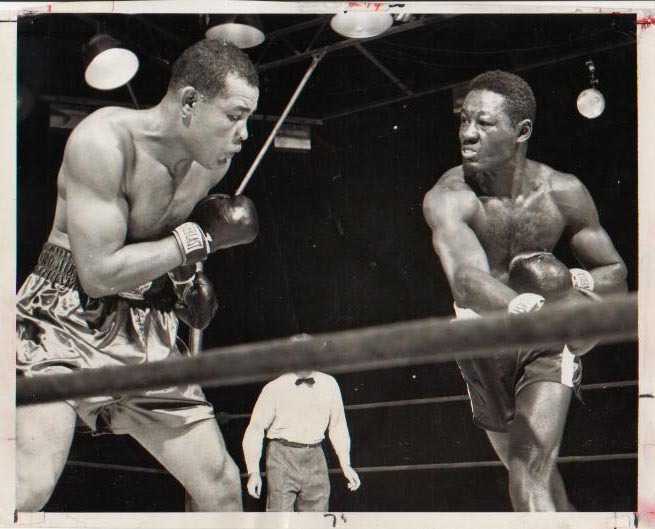 From the first shot, Ezzard Charles was on the back foot, as the Brown Bomber lined up his target and began to attack. The look on the face of the man from the 1950s suggested that even he was surprised at just how ferocious the man in front of him was this night. 90 seconds in, what some predicted would be the end of the line came to be. Joe Louis landed a clean left hook, Ezzard Charles took a half-pirouette, and down went the great boxer at the hands of the great puncher. Referee Arthur Donovan took up the count as the commentators remarked that this fight was scheduled for 15 rounds, but there was no way it looked like it was going that far. Charles rose at the count of six, took the remainder of the eight count…and got to work surviving the rest of the round. The hook had hurt him, sure, but he had the heart of a lion and the eye of the tiger, and this would not be some simple demolition job. There was clutching. There was grabbing. There was even a nice counter left hand that beat a Louis hook to the punch and briefly stunned the now ascendant man in the brown trunks. Most importantly, there was the call from the bell at ringside for a minute’s rest; Ezzard Charles had done what only one other man could so far, and taken Joe Louis to a second round. The minute’s rest gave Charles time to recover. The minute at the end of the first round gave him a blueprint. The corner man pointed out that Louis had not been into deep water; perhaps a bit of rope-a-dope might be in order. It wasn’t exactly rope-a-dope; Louis was too good at cutting down the ring to make that anything but a recipe for getting beaten up and bossed around, and Charles wasn’t about to have all the starch taken out of his attempts to counter by his opponent using the ropes to dissipate the energy of the punches coming back at him. Instead, Charles invited Louis in, moved his head, made his opponent miss, and came back with a shot of his own. He worked straight punches past the looping hooks that Louis attempted to line up in hopes of closing the show. Going down 10-8 had been a wake-up call, but it also gave Ezzard Charles far less margin for error, and this boxing clinic at hand would have to be strong and sustained. The simple fact remains, sometimes survival is a moral victory. Sure, a moral victory wasn’t what he was after, but Charles was the first man in this entire shindig to take Joe Louis to the third round. Not only had he survived, he’d made this a fight. Joe Louis had some adjusting of his own to do. Getting tagged by jabs and straight lefts was no way to make a living in there, and one left hook wasn’t going to end this fight, at least not early on. The results of the first round had seen to that. What’s more, Louis saw that his best advantage lay in fighting on the inside. Louis had a two-inch height advantage, and he also enjoyed a three-inch edge in reach, but this was not going to be about trying to keep his foe off of him; that was not the way of 1938 Joe Louis. Sometimes, giving up his height is the worst thing a fighter can do, giving his opponent a chance to win the fight at the only range where it is possible for that opponent to do so. For Joe Louis, it was exploiting a physical advantage that had shown itself in the first round to be the potential Achilles heel of the man in front of him. Louis bullied Charles to the ropes. 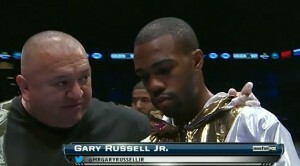 Sometimes he did it behind his jab. 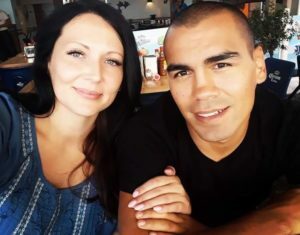 Other times he did it with a bull-rush style that consisted of the application of punches as he walked his man down, absorbing punishment as he came in knowing that the price he paid to get to the spot would be cashed in with interest. Still other times, he just pushed Charles hoping the referee wouldn’t raise too much of a stink given the stakes in the fight. When he got Charles into the corner, Louis went to work on the body, again relying on the nature of the fight and Arthur Donovan’s disinclination to try and make himself the story in this epic punch battle of history. If a shot hit the belt line, Donovan would give a perfunctory gesture of “keep ’em up”, but it was done more for show than as actual warning. It was with that in mind that Joe Louis won the next three rounds for himself on most people’s cards. What the judges were thinking is anyone’s guess, but after five, Louis led 49-45 in the view of the assembled boxing rabble. Something had to give, or this would just be a long-con version of a quick smash-and-grab prior result. Nothing is ever that easy in boxing. Joe Louis had shown a willingness to pay the price to get himself to the inside, but the simple fact remained that a guy with power in his fists and a boxer’s exquisite sense of timing wasn’t going to be bullied for 15 entire rounds. Joe Louis would get lazy with the jab sooner or later. He’d dip his shoulder ahead of trying to hook to the body. Something would reveal his intent for just long enough to get a well-timed punch over the top. That opportunity came in the sixth. Charles caught Louis right flush on the chin with a straight right hand that would have floored any man, anywhere, in any era. Louis dropped as if he’d been smacked in the face with a baseball bat, his legs short-circuited by the violence of the concussive blow. His consciousness itself may briefly have blinked out like the light bulb illuminating a room in a storm when the electrical grid occasionally betrays itself. Louis was, however, down but not out, and he beat the count, rising first to one knee, then to his feet between eight and nine. He walked forward, his gloves cleaned on the shirt of the referee, and resumed his task in front of him. Two full minutes remained in the sixth round, 120 of the longest seconds in sports. Louis tried to do himself what Charles had done in the first, but he’d been the aggressor the entire fight—indeed, he’d been the aggressor the entire tournament. In his attempts to clutch and grab and survive, Louis ended up leaning in a bit too far and Ezzard Charles briefly channeled Jackie Gleason with an uppercut—pow, right in the kisser. Louis went down again. The second punch relied more on simple disruption of balance than in attempted murder, but the result was the same; Joe Louis was on the floor for the second time in the round. Sure, he beat the count, and sure, he got out of the last minute in one piece, but a 10-7 round turned a blowout lead into a skin-tight fight. Four rounds to two is good. Two knockdowns to one against? Not so good. Joe Louis was hurt. His ability to impose his will was left among the spittle and sweat on the canvas while the man himself still had to stand and fight. Ezzard Charles got to work, dancing and potshotting and making the most of the opportunity he’d been given by his own perfect timing four rounds prior. He’d turned a deficit into a commanding lead by virtue of the consistent application of pressure of his own, using his opponent’s aggression against him and continually forcing Louis onto the back foot whenever the bigger man tried to force matters to the inside. This was the flip side to the Joe Louis strategy. A taller man with longer arms giving up his height might work…indeed, it might work the bulk of the time if the taller man has enough punching power and enough sense of himself to be able to let his hands go without unduly shortening up his range and losing the full force of his shots. For the shorter man, that’s a whole different matter. Having your opponent come to you means you don’t have to go find the guy yourself. What’s more, if you don’t have to chase him, you don’t have to get hit in the face in order to close range, and that saves the trouble of risking getting caught to fight at the ideal distance. Some men make beautiful ballet out of the Sweet Science. Others waltz, methodically but gracefully controlling distance. Ezzard Charles was content to turn this fight into a mosh pit. Shoulder to shoulder and fist to gut, the danse macabre that the fight became had turned to the advantage for the man from Cincinnati, and he made full use of that chance. 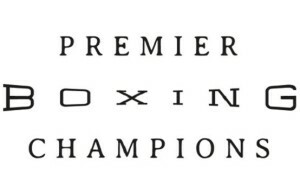 Five rounds from the finish line, Charles led on the press row scorecard by a count of six rounds to four, two knockdowns to one, 95-92 on a ten-point must system. Time was running out for Joe Louis, even with five rounds to go. A puncher’s chance is one of boxing’s oldest ones in the book. We’d seen Ezzard Charles have his chin fail him in the first round. Then again, we’d also seen Joe Louis reduced to a rag doll in the sixth. Lost in all the infighting in the four rounds since, it could be overlooked that these two guys were still throwing punches with bad intentions and landing their share to the head and body. This was not Whack-A-Mole with arms and gloves. This was still a fight. Charles may have done a master’s job in keeping Joe Louis from getting set, but the fact remained that Louis, by virtue of the size difference, still held the ace in the hole, being able to capitalize on the fact that he was really only truly in trouble when he made his own mistakes. If he could force Charles into an error, that would change matters. Sure enough, Louis employed a bit of strategy. A feint got Charles out of position, setting up what was supposed to be a counter right hand but which was thrown from way too far off to be effective and shunting Charles out of position as the punch hit nothing but air. 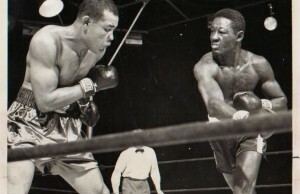 Joe Louis, his feet set and his course decided before setting into motion the sequence of events, uncorked a left hook tighter than a virgin on her wedding night, and boom—Ezzard Charles spent the next nine seconds on the floor and nearly failed to avoid making that ten seconds at the count of the referee. The chase, as it were, was on, 75 seconds of one man trying to kill the other and the hunted man trying simply to make the bell at the end of the round into his very own “Ollie, Ollie, oxen free” in this demented game of hide and seek. Of course Charles survived. We’re not done yet. Still, the knockdowns were once again even; this was going to be once again a count of rounds. Had this been a 12-round fight, it would have surely ended in a draw, as Joe Louis closed the rest of the gap between himself and his opponent on the scorecards with a decisive victory lacking only a knockdown over the course of three minutes. A hurt and fatigued Ezzard Charles spent the 12th in survival mode, conserving his strength for the championship rounds—the real championship rounds, none of this 12-round keep-the-fighter-safe stuff. This was the stuff of Alexis Arguello and Aaron Pryor and Ali-Frazier III and the referee-assisted negligent homicide of Duk Koo Kim. Joe Louis didn’t care. He wanted a measure of closure and to leave this in a way where the judges or anyone else could not gainsay the quality of his performance. He was in for the kill. The fierce man who had come out trying for another blowout was back on display against his battered opponent, and at one point Ezzard Charles was forced to his knees as a barrage of body punches threatened to turn this into a 13-round rather than a 15-round fight. With that knockdown, and with a potent 14th round coming in behind it, there was only one way Ezzard Charles was winning this fight. He had three minutes. One round would settle this entire event, bringing months of preparation to a proper conclusion. Charles went for broke. He found the strength of the gods and the berserker’s rage like the Norsemen of old for the ultimate showdown of ultimate destiny in front of him, though perhaps the comparison was less Viking and more Spartan—Ezzard Charles would come back with this shield or on it. Even Joe Louis was taken by surprise. Throwing to the body, it is said as a truism of boxing lore, is like putting money in the bank, and by now Louis was supposed to be a millionaire; the bruises on Ezzard Charles’ midsection were supposed to have spoken to that. Yet here was the maddest of madmen, fighting with the ferocity of a man who was testing the limits of another sports cliché—who wants it more? Charles used his shoulders. He used his elbows. He used pushing and wrestling to create space. Most importantly, Ezzard Charles used his fists, testing one final time whether Joe Louis could stand up to him. It took 22 seconds for the first crack in the armor. Joe Louis was on the ground, the referee counting, the first of two bonus points Charles needed to score to bring this fight back to even or to a potential split decision that had any chance of going his way. The belief at ringside was that the judges would do anything in their power to avoid having to score this fight a draw if it were at all possible for them to do so; there was no way this was going to end in a kissing-your-sister moment right out of an old-time hockey game. It took another 30 after the count for Louis to fall again. Ezzard Charles posed over the fallen man as if he were channeling Muhammad Ali in one of boxing’s iconic photos, but Joe Louis was not Sonny Liston. He was down; he was not out. Unfortunately for him, he was also down in the sense that a 10-7 round was surely in the offing, and it wouldn’t have been a shock for a referee, desperate to avoid the previously-mentioned scenario of a draw, to score it 10-6 just to tilt the balance. Charles didn’t want it to go that far. He had two minutes, and he spent the first minute imposing relentless pressure, not sitting back, not giving the judges any chance to doubt him, just applying unceasing offense to steal this contest in the final stanza. And somewhere in the darkness, somewhere between night and day when the sun prepares to make its appearance while tired men and women rise from slumber cut short by the demands of workaday existence, Ezzard Charles got that win. Somewhere in the mists of time, Joe Louis gave up, folded by the pressures of a man who simply engaged an extra gear guided by the gods. Somewhere the gamblers cashed in their tickets that 1950 would beat 1938 at a fair payout above even money. Somewhere this fight ended with a bell ringing after three minutes had elapsed. That somewhere is not here. With only eight seconds on the clock in the final round, Joe Louis finally caught Ezzard Charles with a vicious hook to the body, one that landed right on the liver and did more damage to that organ than a thousand bottles of beer and fifths of whiskey and awful food could ever have hoped to accomplish. Charles tried desperately to beat the count. He rose halfway, getting as far as one knee, but all the adrenaline, all the will, all the heart in the world were not with him—his deal with the devil had been aborted in the cruelest of ways, and this fight was over. Joe Louis had left no doubt, and it was Joe Louis who would be crowned the ultimate champion, the greatest heavyweight boxer in the history of the sport. Some have asked whether any man on any night could have beaten Joe Louis the night he knocked out Max Schmeling. The answer…is no. NEXT WEEK: The Dream Fight! The story proper ends here…but we’ve got a bit of silliness, a love letter to the childhood of everyone who grew up in the era of old-school Nintendo…I won’t spoil it. Just tune in. It’ll be fun. 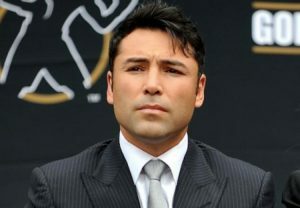 Fox Doucette writes the weekly What If series and covers ESPN Friday Night Fights for The Boxing Tribune. His weekly opinion column, The Southpaw, appears on Thursdays. Fan mail, hate mail, and disputes of the result can be sent to beatcap@gmail.com.